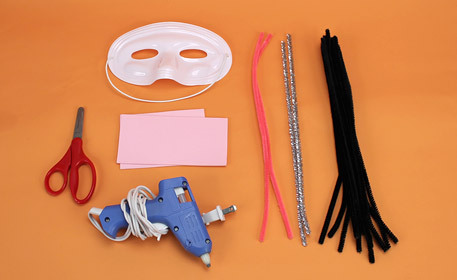 Create texture on plastic masks by cutting and rolling pieces of Fuzzy Sticks and sport your creation on Halloween! Cut black Fuzzy Sticks in half and coil to form round, flat spirals. 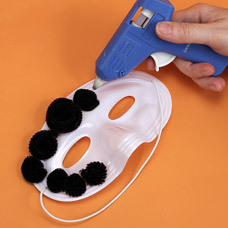 Glue the coils onto a Plastic Mask using a strong glue. 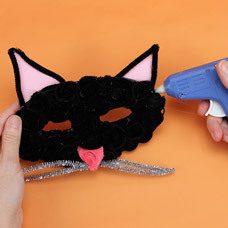 Ask an adult for help if you chose to use a hot glue gun. Tip: you might want to make smaller Fuzzy Stick coils to fill in gaps. Coil a pink Fuzzy Stick into a flat triangular coil. Glue onto the mask as a nose. For the ears cut (2) triangles out of pink foam sheet. Glue triangles to the backside of the mask. 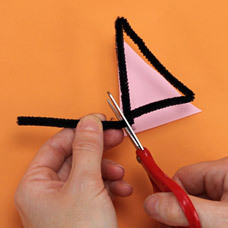 Line triangles with black Fuzzy Sticks. Fold (2) Glitter Sticks in half glue the Glitter Sticks onto the sides of the nose as whiskers. 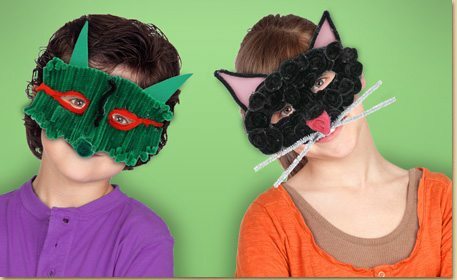 Your Cat mask is now complete!